Stamp This Into Your Brain: Get the Message–or Else! Born in suburban New Jersey, Joan Fry wanted to be a cowboy when she grew up. That didn’t happen. Instead, she flipped hamburgers for the White Castle, taught horseback riding at summer camp, sold subscriptions to Life magazine door-to-door, and spent a year in a Kekchi Maya village in Belize teaching the children their ABCs. After graduating from the University of Michigan, Joan moved to New York and dabbled briefly in modeling before she took a job with Time magazine. She returned to Michigan to marry novelist and short story writer Allan Seager. His last book, The Glass House, a biography of poet Theodore Roethke, is available from the University of Michigan Press. In 2004 the Press republished a collection of his short stories, A Frieze of Girls: Memoirs as Fiction, with a new introduction by Charles Baxter. After a long career as a freelance writer, Joan decided it was time to think about job security. Armed with an MFA from the Professional Writing Program at the University of Southern California, she began teaching again, this time at the community college level. 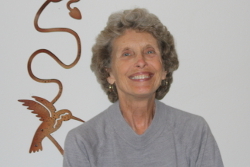 She has taught writing for many years at Antelope Valley College and California State University at Northridge. In 1978 she married horse trainer John Fry. A former Las Vegas craps dealer, John was also an avid sport fisherman. He designed and patented a “fishing machine” that allowed anglers to experience fighting a 500-pound marlin. After leaving the horses, John started his own business, Inter-Valley Pool Supply. Now semi-retired, John designs and builds custom furniture. He and Joan moved to the California high desert in 1998. 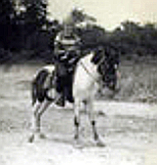 These days Joan spends her time writing, reading, and trail riding. She and John share their bank account with her horse Gunsmoke, a rescue; lucky dog Chance, a reclamation project from the local animal shelter; a golden retriever named Roxie, and three cats, also rescues.